Despite a fierce battle by many fiscal conservatives and some anti-corporate liberals to dismantle the Export-Import Bank, Congress reauthorized it in December 2015–after allowing its charter to expire six months earlier. As the presidential race heats up, Democratic nominee Hillary Clinton is in favor of the Bank, and Republican nominee Donald Trump is against it. Although the Ex-Im Bank dominated political news last summer, the debate quickly dissipated as other political priorities emerged. With the upcoming election and uncertainty surrounding the slow growth of the economy, talk of abolishing the long-standing institution should come to the forefront of the economic debate once again. Explained by politicians as a job-creator and a means of assisting American companies’ exports to foreign markets, the Ex-Im Bank does not help small business. Rather, it subsidizes the sale of American products to foreign countries at the taxpayer’s expense. This is accomplished by substantial loans to overseas companies, many of which are owned by their respective governments. Created in 1934 by executive order to facilitate trade between the United States and the Soviet Union, the Export-Import Bank has since become a mecca for major corporations seeking out government subsidies. A 2014 report from Open The Books, a project of American Transparency, showed that the top 50 importers subsidized by the Ex-Im Bank received $80 billion in taxpayer financing. Worse yet, this money is concentrated greatly in only two industries: 45 of the top 50 importers are either foreign airlines or energy companies. Since 2007, one-third of all transactions done by the Bank have gone to benefit aircraft giant Boeing, a clear example of the Bank’s special interest nature. 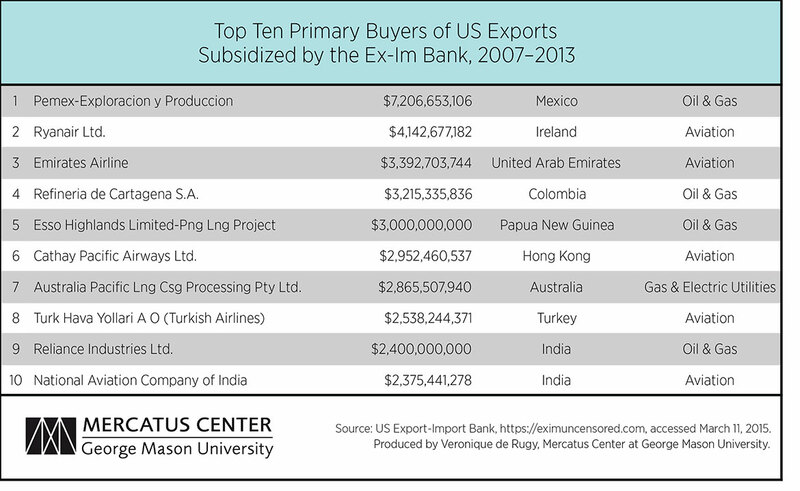 In an analysis of Ex-Im data, Mercatus Center senior research fellow Veronique de Rugy shows that the largest foreign beneficiary of these subsidies is Pemex, the Mexican oil and gas giant. From 2007 to 2013, the Ex-Im Bank gave Pemex $7.2 billion. In context, Boeing alone received at least $5.4 billion in loan guarantees from the Bank in fiscal year 2015. To use a financial analogy, the Bank has invested heavily without diversifying, and this could cost taxpayers a lot of money if something goes wrong in the energy or airline industries. One famous example of Ex-Im’s failure is Solyndra, the green energy company whose sale of solar panels to Belgian companies was subsidized with $10.3 million in taxpayer dollars. Despite many warnings that the company would likely go under, the Ex-Im Bank and the Department of Energy approved the subsidy. Six months later, Solyndra was out-of-business. Abengoa, another green energy company, received around $150 million from the Ex-Im Bank while former New Mexico Governor Bill Richardson was sitting on the advisory boards of both Abengoa and the Ex-Im Bank, a clear conflict of interest. Many politicians continue to back the Bank, despite its obvious cronyism and failed investments. Interestingly, some who support Ex-Im, such as Senator Lindsey Graham (R-SC), list Boeing and/or General Electric among their top five donors. It is no wonder that the Bank was reauthorized after only five months of closed doors. Hillary Clinton favors the reauthorization. During a Democratic debate in Flint, Michigan, with Senator Bernie Sanders (I-VT), Clinton said "I think we’re in a race for exports. Here in Michigan, there’s been $11 billion in recent years used to support exports, primarily for small business. I favor it, he opposes it." Senator Sanders vehemently opposed the Bank, stating "Democrats are not always right. Democrats have supported corporate welfare." In contrast to Clinton, Donald Trump opposes the Ex-Im Bank. In an interview last summer, he said, "I don’t like it because I don’t think it’s necessary. It’s a one-way street also. It’s sort of a feather bedding for politicians and others, and a few companies. And these are companies that can do very well without it. So I don’t like it. I think it’s a lot of excess baggage. I think it’s unnecessary." Clinton’s position on the Ex-Im bank is a mistake. While her appeal to Americans’ fear of unemployment may earn her some favor, it fails in comparison to the hard-hitting Sanders narrative of "corporate greed" or Trump’s "feather bedding for politicians." And it is not just Trump supporters who despise the principle and results of the Ex-Im Bank. Whether this issue is approached from a fiscal conservative (the United States should save as much money as possible), libertarian (it is wrong for government to take money from special interests to pick winners and losers), or even a socialist (government should not work to benefit major corporations) perspective, there is a strong argument to be made in opposition to the Ex-Im Bank. Bernie Sanders and Donald Trump both understand the cronyism inherent in the Ex-Im bank. Trump is correct that the Bank is "unnecessary" and Clinton’s support of corporate welfare plays poorly into her perception as a corrupt insider. Perhaps this is why some Sanders supporters are backing Trump, according to Pew Research and West Virginia exit polling data. Clinton should focus less on providing welfare to college students and more on taking it away from big corporations. She may just do some good in the process.